You read the title correctly! 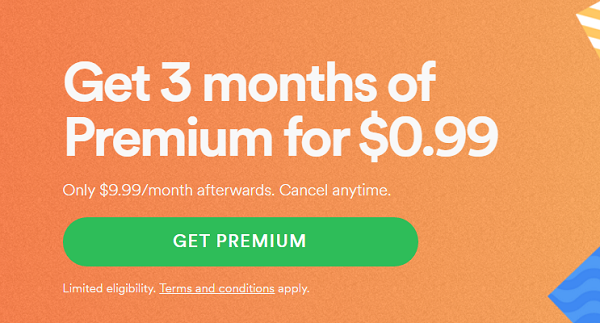 Spotify has its special three months of Premium for $0.99 summer promotion. The deal will allow for newcomers to tryout the service for during a period when all of the seasonal events and heavy tourism kicks off. The promotion also gives regular Spotify users who don’t or can’t commit to a regular subscription a chance to jump in and enjoy the service for a long time—certainly longer than the usual two week or one month promos that pop up with streaming services. If you never picked up the Premium promo prior you’re not eligible for this offer. It expires June 30th so there’s a decent amount of time to decide if you want to jump in on the promo.